S I G N & D I G I T A L G R A P H I C S • June 2018 • 73 Compact Led Signage iSIGNS Inc., Fairview, Pennsylvania, offers small to mid-size compact LED signs for indoor and outdoor use...now with any message. Customize messages and font size; include logos or symbols. Choose from models with bright direct- view LED messages or bold LED backlit messages. Slim- line, light-weight cabinets make these signs ideal for wall, ceiling mount and canopy installations. Signs are commonly used for drive-thru lanes, auto dealerships, service centers, parking facilities, loading docks, workplace safety and more. Get free target market sheets to help generate new business providing these energy efficient LED signs. For information, visit www.isignsled.com. 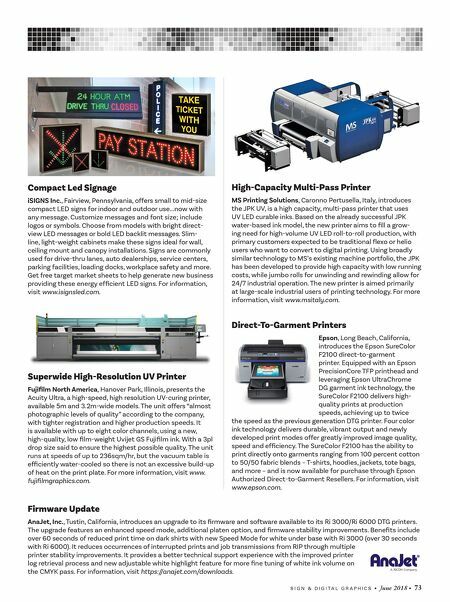 Superwide High-Resolution UV Printer Fujifilm North America, Hanover Park, Illinois, presents the Acuity Ultra, a high-speed, high resolution UV-curing printer, available 5m and 3.2m-wide models. The unit offers "almost photographic levels of quality" according to the company, with tighter registration and higher production speeds. It is available with up to eight color channels, using a new, high-quality, low film-weight Uvijet GS Fujifilm ink. With a 3pl drop size said to ensure the highest possible quality. The unit runs at speeds of up to 236sqm/hr, but the vacuum table is efficiently water-cooled so there is not an excessive build-up of heat on the print plate. For more information, visit www. fujifilmgraphics.com. High-Capacity Multi-Pass Printer MS Printing Solutions, Caronno Pertusella, Italy, introduces the JPK UV, is a high capacity, multi-pass printer that uses UV LED curable inks. Based on the already successful JPK water-based ink model, the new printer aims to fill a grow- ing need for high-volume UV LED roll-to-roll production, with primary customers expected to be traditional flexo or helio users who want to convert to digital printing. Using broadly similar technology to MS's existing machine portfolio, the JPK has been developed to provide high capacity with low running costs, while jumbo rolls for unwinding and rewinding allow for 24/7 industrial operation. The new printer is aimed primarily at large-scale industrial users of printing technology. For more information, visit www.msitaly.com. Direct-To-Garment Printers Epson, Long Beach, California, introduces the Epson SureColor F2100 direct-to-garment printer. 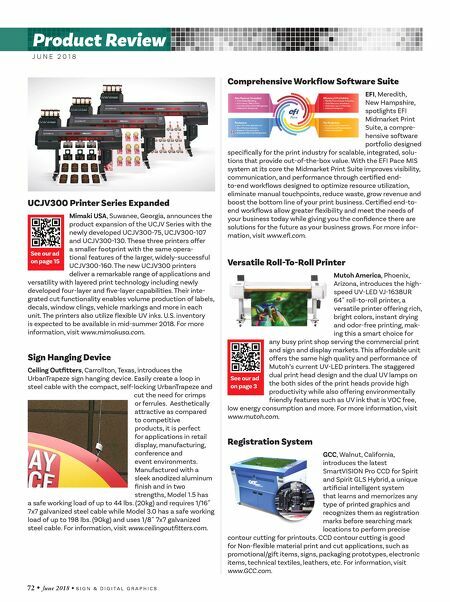 Equipped with an Epson PrecisionCore TFP printhead and leveraging Epson UltraChrome DG garment ink technology, the SureColor F2100 delivers high- quality prints at production speeds, achieving up to twice the speed as the previous generation DTG printer. Four color ink technology delivers durable, vibrant output and newly developed print modes offer greatly improved image quality, speed and efficiency. The SureColor F2100 has the ability to print directly onto garments ranging from 100 percent cotton to 50/50 fabric blends – T-shirts, hoodies, jackets, tote bags, and more – and is now available for purchase through Epson Authorized Direct-to-Garment Resellers. For information, visit www.epson.com. Firmware Update AnaJet, Inc., Tustin, California, introduces an upgrade to its firmware and software available to its Ri 3000/Ri 6000 DTG printers. The upgrade features an enhanced speed mode, additional platen option, and firmware stability improvements. Benefits include over 60 seconds of reduced print time on dark shirts with new Speed Mode for white under base with Ri 3000 (over 30 seconds with Ri 6000). It reduces occurrences of interrupted prints and job transmissions from RIP through multiple printer stability improvements. It provides a better technical support experience with the improved printer log retrieval process and new adjustable white highlight feature for more fine tuning of white ink volume on the CMYK pass. For information, visit https://anajet.com/downloads.